Renowned expertise, personal assistance, and short delivery times. Precisely defining the binding site of your antibody to its target protein. Unique technologies with unprecedented possibilities for drug discovery collaborations. Pepscan is a premier provider of peptide based products & services. 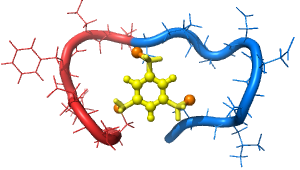 We also offer our profound knowledge of peptides for drug discovery collaborations. Pepscan is specialized in constrained peptides, and is the inventor of the CLIPS constraining technology. Our bicyclic ‘2-CLIPS’ peptides represent a new generation of biotherapeutics, offering antibody-like affinity and selectivity in a small, fully synthetic molecule. Informs you about new products, publications and other interesting developments at Pepscan as well as in the industry.